Inspiration can come from anywhere, including a recent trip to the Vietnamese sandwich shop near by to have a fairly lackluster Special Banh Mi. Banh Mi simply translates as “bread”, but has come to mean the sandwich served on a specific type of crispy, French-inspired, demi-baguette. The classic is known as the “special” and comes with liver pâté, cold cuts of Vietnamese pork sausage and barbecued pork, daikon and carrot pickles, and house made mayo. A pretty rockin’ combo, but the one I got…not so good. But it got the creative juices flowing. Liver pâté, pork sausage, barbecued pork – perhaps a world away geographically, but culinarily not that far from traditional German. Why not smoked liverwurst in place of pâté? How about slow roasted bratwurst as the pork sausage and a six-hour, applewood-smoked pork shoulder? Quick-pickled radishes and carrots and a seasoned mayo finish it off. The roll is a Mexican bolillo-style available from a local bakery – thin, light crust with a airy interior. The roll was buttered and then tossed on the grill to get the shattering crispiness characteristic of great Banh Mi. The smoked liver sausage adds a deep meaty richness to the layers of porcine delight. The brat was a house-made variety from a local grocer, roasted over hardwood grill at about 400 degrees, off to the side slightly from the main coals in order to slow-cook it without splitting and losing all those incredible pork fat juices. The pulled pork was a pork shoulder seasoned with salt, garlic, oregano, and paprika then slow smoked with apple wood at 275 degrees for over six hours. Not quite roast suckling pig, but it’ll do in a pinch. So all the ingredients were firmly in the tradition of German-American cuisine from the Great Lakes region. How they came together was an entirely modern inspiration, born of our ever-broadening exposure to cuisines and traditions from around the world.Even a not-so-good sandwich can send us off in new and exciting directions. A little bit like racing through the German country-side where “Limits no longer apply”. 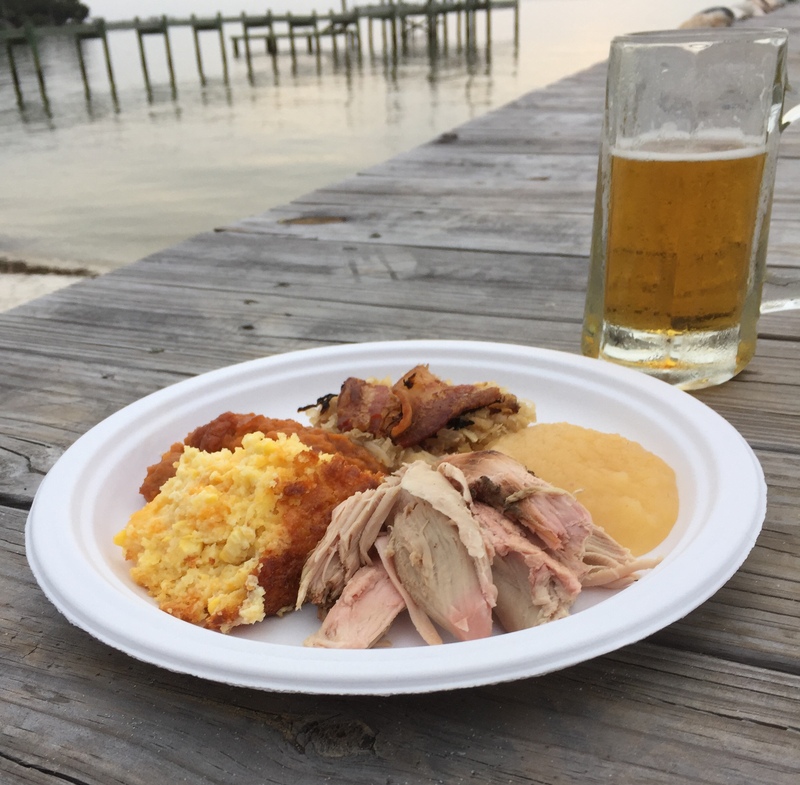 What are you thinking – like a pork shoulder? How would we get one? How would we cook it? Even a small pig wouldn’t fit on the gas grill. And that is how it started. This all happened over a recent spring break vacation down in Florida, with three of our families visiting my parents there. Dad was on board, so all that remained was figuring out how to do it. I’ve actually had some experience roasting whole pigs. The local soccer club has a long German heritage and puts on a wonderfully authentic Oktoberfest each fall as the major fund raising activity. I’ve volunteered several autumns nights to help the older generation of Milwaukee Germans to roast brats, whole chickens, and whole pigs which accompany the imported German beers. They have a permanent set-up including shallow pits for the hardwood charcoal and metal brackets to hold the large wooden shafts that are used to rotate the pigs. 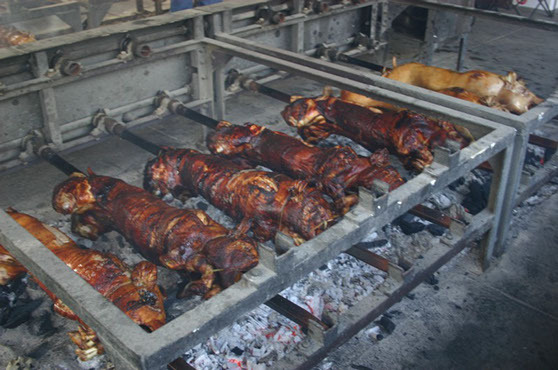 The charcoal can be shifted and the pigs can be move up or down to control heat. So I had an idea how to skewer and tie the pig, but we didn’t have an Oktoberfest roasting shed. I’ve seen the pig done traditional spanferkel-style as well by the folks at Bunzel’s Old Fashioned Meat Market in Milwaukee. Going on four generations, they have roasted pigs in the traditional German style with all the appropriate fixings. They have these beautiful mobile roasting units which look like large iron barrels rigged with a rotisserie unit to keep the pig rotating. Heavenly food. But we didn’t have one of those either. So Kyle starts talking to folks locally, starts calling around. He finds a place with a whole suckling pig ready to go in Tallahassee. That will work. Now we have to figure out how to cook this thing. A 55 gallon drum should be big enough. So that started a scavenger hunt. After a number of fruitless stops, we found a barrel and some grills that had been old oven racks. Now it was up to Kyle to engineer this thing. He had it done in less than an hour. Hinged top, handle to open it, air holes, holes through the side to allow the spit to rotate. I’m telling you, less than an hour. 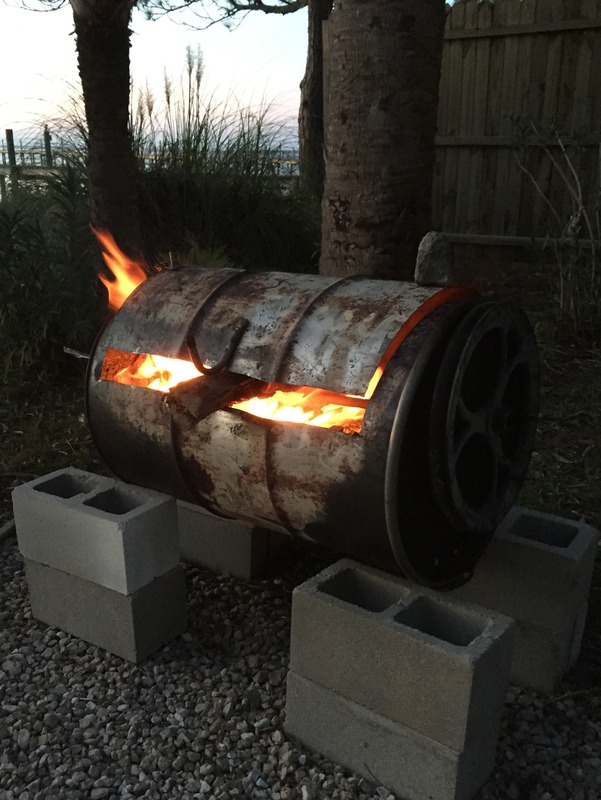 Then we had to burn the barrel out at high heat to prepare it for the next day’s smoking. See that big iron pulley on the side? Our wheel for manually rotating the pig. While he built the roaster, I put together a brine for the suckling pig. I used my standard brine approach, but the quantities are a bit fluid. Hey, I was on vacation and the beers were flowing. Basically it was a giant pot of water (about 2 gallons) brought to a boil, salted until it was about twice the saltiness of ocean water. I added a bottle of apple cider vinegar, two bottles of beer, a hand full of bay leaves, two heaping tablespoons of crushed garlic, three sliced onions, a whole mess of dried herbs, and then liquid cane sugar in place of the more traditional honey. Liquid cane sugar is used in the south like maple sugar, thick and caramel like molasses, but less bitter. When the whole mix came to a boil, I killed the heat and then added an equal volume of ice to dilute the brine. Poured the whole mix over the pig, weighed it down, and then let it sit for 24 hours. The next morning we fired up the grill about 9 AM to get the coals just about perfect an hour later. Then pig on the spit and onto the grill. We used hardwood charcoal supplemented with soaked oak to get a bit of extra smoke and washed the pig every half hour with the brine. Ain’t she a beauty? We are only about an hour in at this point. The temperature gauge visible in the upper left corner was our one major expenditure in building the roaster. Think it was like four bucks. We tried to keep our temp in the 250 degree range, but found the small space was a little tricky to hold at a constant temp. It kept wanting to climb on us. Turns out the lower racks might not have been necessary. It also turns out that drinking all day may not make you the most diligent cook. After six plus hours it came out a bit darker than I expected, but the meat was just done. 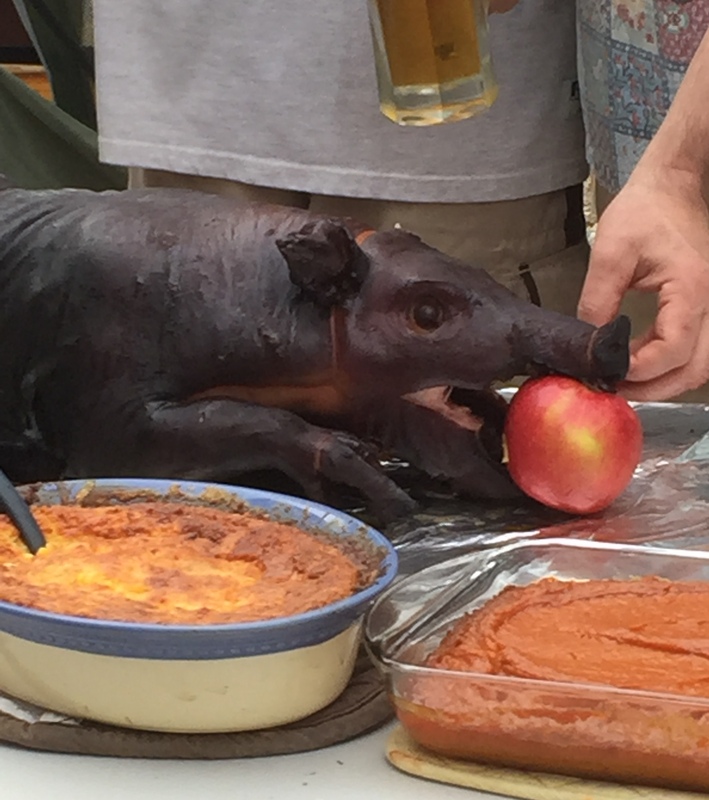 We served our spanferkel with whipped, spiced sweet potatoes, a corn cheddar pudding, sauerkraut baked for an hour topped with smoked bacon, and more beer! Though we were definitely in the German tradition with our meal, our beer of choice for this feast was Tatra, a pale lager brewed by Zywiec Brewery from Poland. 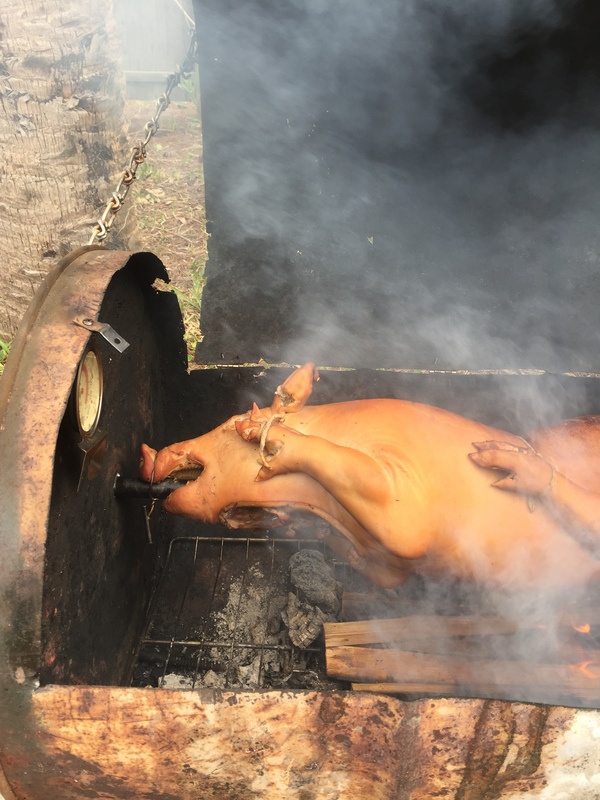 Our pig was meltingly tender, moist, and just a hint of smoke. This wasn’t the fall-apart tenderness of a long roast over higher heat, but the more unctuous tenderness of a suckling pig, where the higher gelatin content creates a lovely creamy texture. To play up our Southern locale, my sister made three great barbecue sauces each in different southern styles, but I elected to go au naturel. Of course, Kyle knew that all along. A smiling, white-haired gentleman greets me and I give him the name of our party. “Oh, you’re having lunch with my good friends today. 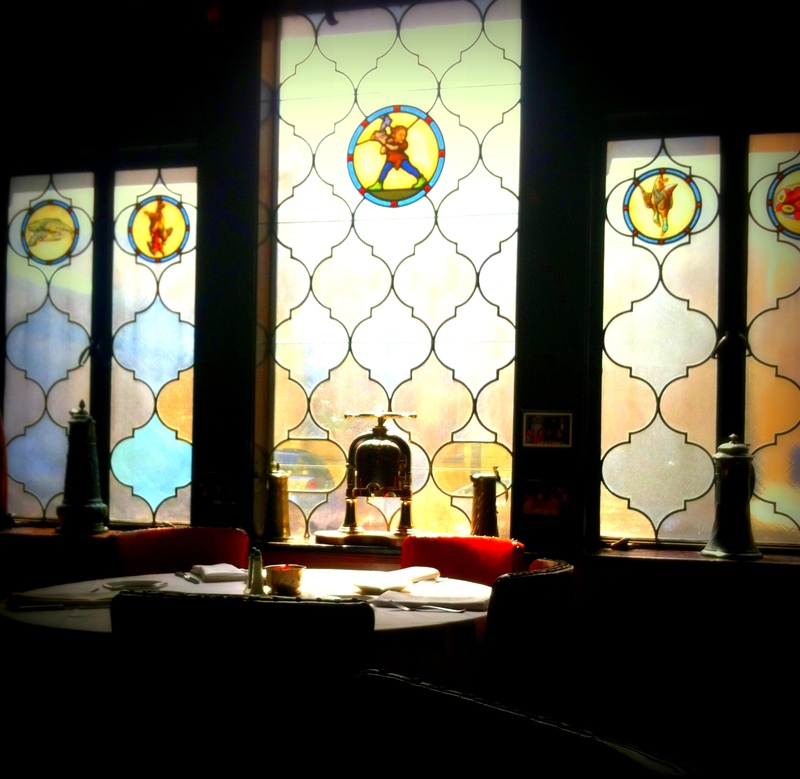 Welcome.” The dining room has plenty of dark wood, lit by stained glass and low lights. Nearly every bit of wall space has either a German artifact or a framed photo of a celebrity, some long forgotten, who enjoyed the authentic German cuisine at Karl Ratzsch’s some time over the last 111 years. My friends arrive with excited greetings and hugs. They sit down and share their history with me. Their first date was at that table there, 45 years ago. The smiling gentleman who greeted me? He’s been a waiter here for 35 years. The owners, who took over from the Ratzsch family in 2003, have been working behind the bar and in the kitchen just as long. The conversation turns to dogs and gardens and confrontations with a raccoon in the yard. We decide to order. The soup of the day is cream of mushroom. The every day soup is consommé with liver dumplings. It’s amazing; earthy, rich, unique. The spinach salad following has a hot bacon dressing that actually tastes “fresh”. That doesn’t sound right, but there isn’t the fatty mouth feel you can get with a hot bacon dressing yet all of the flavor. This is classic food, prepared in a way to remind you why it became classic. 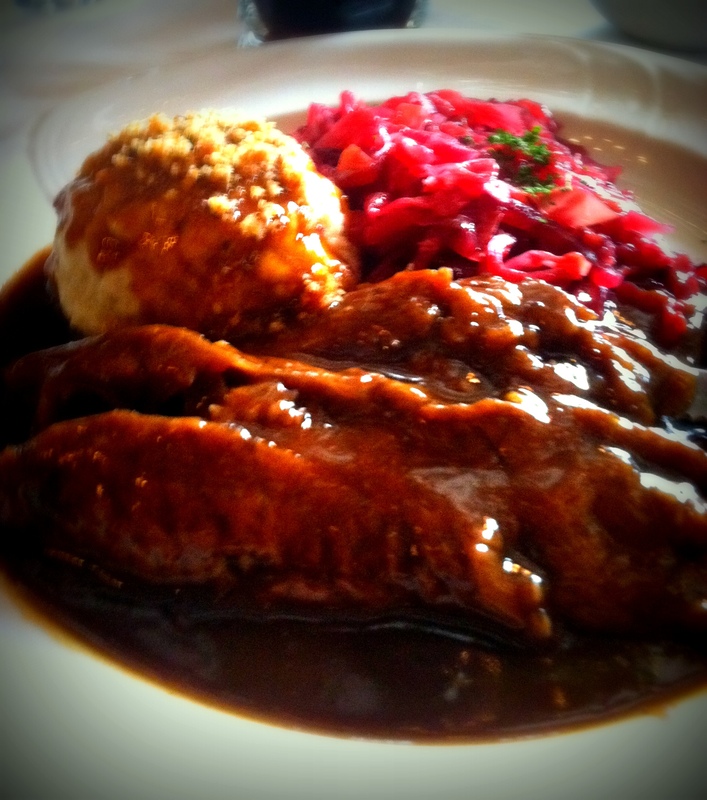 Then there is the sauerbraten. Oh dear heavens. I’m a fan of sauerbraten. We’ve shared our recipe here. This version is fall-apart tender with an authentic gingersnap gravy, the meaty richness balanced by the tang of vinegar, cooked down together for hours. The accompanying red cabbage has the perfect texture and flavor. We’ve also shared our red cabbage recipe. Here is my advice, go eat at Karl Ratzsch’s if you can. Only try to make your own if you can’t get there. This is wonderful, wonderful food. I’m enjoying it with a Köstritzer Schwarzbier. We continue to talk and enjoy the meal. A few other parties come in, a few parties leave. I feel like I’m eating in my great grandma’s living room, in the very best way. I feel like family. As we leave I take a moment to adjust to the afternoon sun. I look up to the clock on City Hall. It seems we were there for over two hours. It was a moment, a moment completely out of time, a moment from 100 years ago. This is history. This is inspiration. With some free time in the Madison, WI area you can discover all sorts of lovely surprises, including two new additions to our Purveyors page. 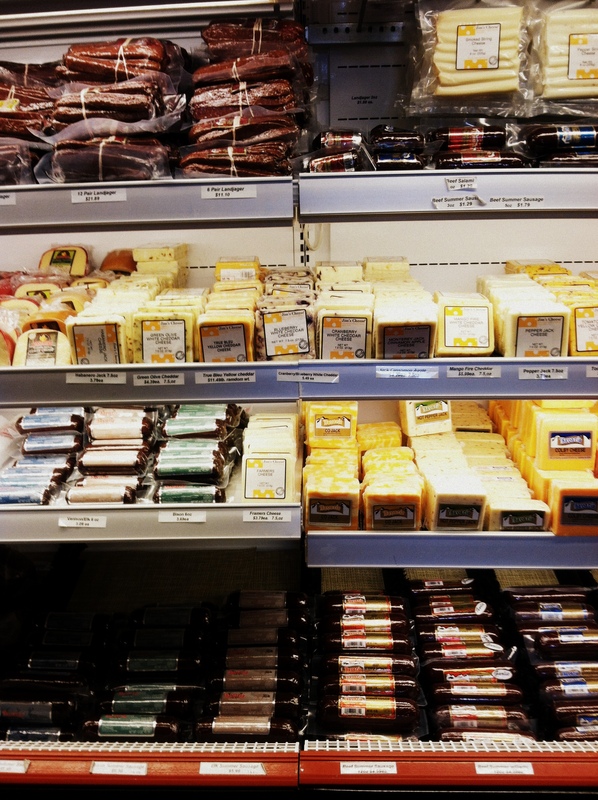 On a recent business trip to the area, a walk around Capitol Square brought me to Fromagination, a specialty cheese shop featuring Wisconsin cheeses and other artisan and local products. It is an absolute gem of a store, which my poor picture does not do justice. 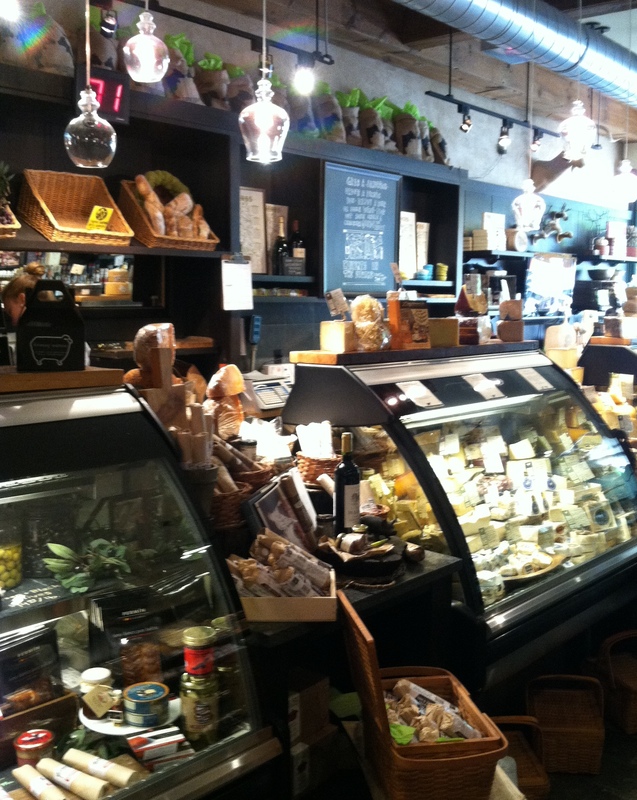 The service was helpful, offering tastings of a number of different cheeses including a number of exclusive offerings. They clearly have an excellent relationship with their suppliers, as some the cheeses on offer here will not be found any where else (How about a curry-rubbed, Manchego-style cheese aged for 6 years?). A new offering from an old favorite eventually caught my eye, Golden from Holland’s Family Cheese. Their description: “This creamy, semi-soft, American Original boasts a flavor profile rich in nuttiness with hints of sweet fruit. Handcrafted by award-winning cheesemaker, Marieke Penterman and her team, this raw milk beauty is carefully aged on Dutch pine planks in our cellars.” The flavor profile is full and creamy, reminiscent of a young sheep cheese. We paired the Golden with the other end of the Holland Family Cheese spectrum, the “Super” aged Gouda, which has a Parmesan-like texture with a deep, caramel nuttiness. A quick trip west of Madison will take you to the Fitchburg/Verona area, which is the edge of the Driftless Region, an area that has been left untouched by the glaciers which flowed over much of the Great Lakes region in the geologic past. Here is where Bavaria Sausage continues a 5o year tradition of making authentic German sausage. Smoked sausage, fresh sausage, frozen sausage, smoked meats, thick-sliced bacon, and nearly every German condiment you could ask for (How about seven varieties of curry ketchup?). Amongst the variety of summer sausages, we selected the venison, and then grabbed a small beef summer sausage for comparison. Check out the bundles of landjaeger (upper left). 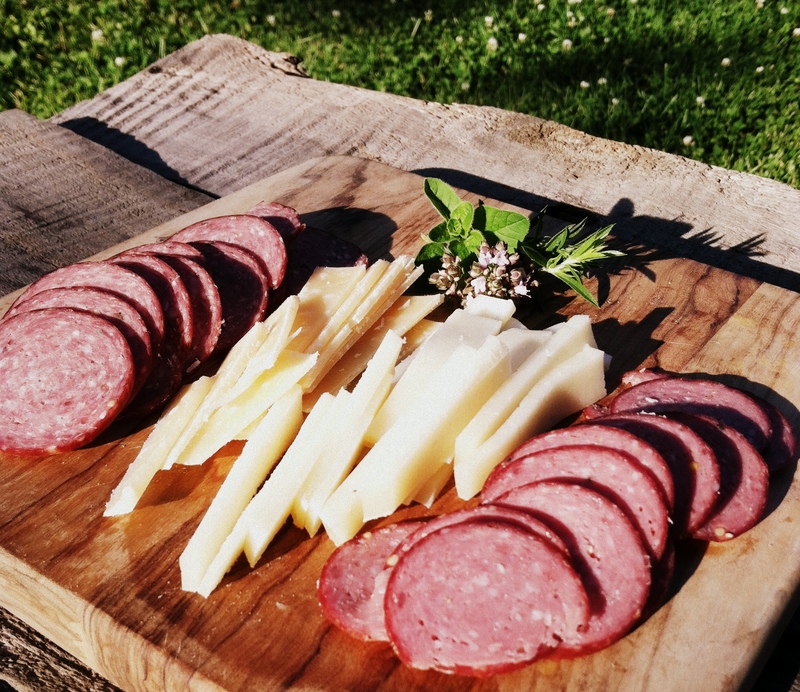 The venison summer sausage is blended with beef which balances the flavor and adds moisture. Bavaria Sausage uses no fillers, no colorants, no artificial flavors. The flavors of the sausage are pure meat. In the picture below, the darker venison sausage is on the left, paired with the Super. The beef summer sausage on the right was paired with Golden. But playing with combinations made this a simple, tasty, quickly consumed treat, enjoyed with summer cocktails. So as you drift through the area, explore the old traditions, and the new producers. Enjoy the experience of ethnic traditions honored, and made new again. This is the exploration of Great lakes Cuisine.